The capital city of Ireland Dublin, is synonymous with Guinness, the black and creamy stout that is loved the world over. In this section, you will find information about the Guinness brewery experience as well as various microbreweries that are also found in Dublin and the rest of rural Ireland. Guinness is unmistakable. It’s colour, texture, flavour, and creamy head, immediately identify it to even the most uneducated of beer drinkers. The brewery in Dublin can be booked for a tour, and you can combine that with lunch or dinner. 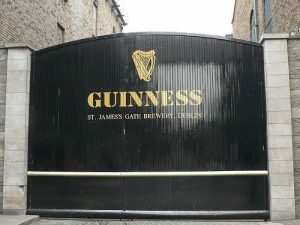 You get to see the whole process of how Guinness is brewed, as well as the history of the site, and how the beverage has been made over the years. At the end of the tour, you are rewarded with a delicious pint of Guinness. The stuff they pour over there just somehow tastes so much better than the stuff in cans. This brewpub is located in Temple Bar, which is the centre of all social activity in Dublin. The brewery was set up by a former lawyer, and his personal recipes have created 12 distinct beers, stouts and ales which are served from the tap. This drinking haven in the pretty seaside city of Cork does not look like a microbrewery from the outside, given that it is modern with an all-glass exterior. It is found inside Blackrock Castle, and is owned by people who run a nearby cafe. The brewpub makes its own stouts, lagers and ales which are served with delicious modern cuisine. You can’t get more Irish than this. This brewpub is everything you would expect from the Emerald Isle with open log fires, and plenty of singing and dancing on the stone-slabbed floors. This brewery makes things up as it goes along, constantly experimenting, but it specialises in Emerald Pale Ale, which has a lemony tang.